Rebecca also made the rounds on the internet with her comic, Don’t Cry For Me I’m Already Dead. In just a few pages it tells a sweet story of two brothers who share a love for Simpsons quotes. Even in re-reading this again it can make me tear up. Prepare your feelings. The line work is especially impressive. Steven Universe has a very clean look, but in these two works we see a style that plays with really expressive lines, especially on the characters faces. I can’t get enough of it. Thankfully, a fellow fan has preserved the entire comic here. Going further back, she also released two issues of a comic called Pug Davis about a canine astronaut. It’s here that we’re going far back enough that we start to lose pages between the cracks of the Internet. About half the pages still exist on an archived version of her site. 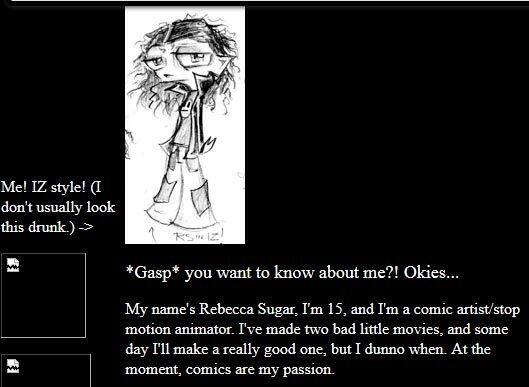 Rebecca’s personal website, blog and Deviant Art have all been purged, but again through the Way Back Machine, a few gems can be unearthed. Most of these are low res thumbnails, but it’s nice to see the early phases of her style as well as some wicked paintings. When people comment or write about her art, people often remark how technically and creatively accomplished she was as an early twenty-something year old artist. This is absolutely true, but it’s a nice reminder that we all need to start somewhere. Behold! A drawing by 15 year old Rebecca Sugar of herself. It’s in the style of Jhonen Vasquez’s Invader Zim. Knowing his influence, you can see traces of it in her old Deviant Art pictures and perhaps in some of the action scenes of Steven Universe. She also writes about a 28 page comic she made called Raven Drake that she tried pitching to Slave Labor Graphics, but it got turned down so ended up selling it through local comic book shops. If anyone has a copy of that – upload that! Because it doesn’t seem to be anywhere on the internet. Let’s not forget that in addition to being an artist, Rebecca has contributed several all-too-catchy songs to both Steven Universe and Adventure Time. She’s the reason you can’t stop singing Bacon Pancakes in your kitchen. But here’s where the Internet fails us. Because although you can find a music page on Rebecca’s old website with links to ten original songs, every one of those links is dead. I guess we will have to be content with the current slew of amazing songs featured in Steven Universe. Or y’know, follow her on Tumblr where she continues to post promo art, character designs and song demos.